In moving and refreshingly candid prose, Rescuing Julia Twice tells Traster’s foreign-adoption story, from dealing with the bleak landscape and inscrutable adoption handlers in Siberia, to her feelings of inexperience and ambivalence at being a new mother in her early forties, to her grow­ing realization over months then years that something was “not quite right” with her daughter, Julia, who remained cold and emo­tionally detached. Why wouldn’t she look her parents in the eye or accept their embraces? Why didn’t she cry when she got hurt? Why didn’t she make friends at school? Traster de­scribes how uncertainty turned to despair as she blamed herself and her mothering skills for her daughter’s troublesome behavioral is­sues, until she came to understand that Julia suffered from reactive attachment disorder, a serious condition associated with infants and young children who have been neglect­ed, abused, or orphaned in infancy. Hoping to help lift the veil of secrecy and shame that too often surrounds parents struggling with attachment issues, Traster describes how with work, commitment, and acceptance, she and her husband have been able to close the gulf between them and their daughter to form a loving bond, and concludes by providing practical advice, strategies, and resources for parents and caregivers. My shelves are lined with books for foster and adoptive parents—books about special needs, parenting techniques, trauma, preparing for foster care and adoption, and so on. Some read like scientific textbooks, while others are lighter reads. This book, however, after so many parenting books, captured me and drew me in first with Tina’s talent for words and second with her honesty and realness. As a memoir, the book chronicles the Trasters’ journey from the decision to adopt, their travels and the process, and their life in the years following. I found myself relating to some of her thoughts and feelings as an adoptive mother attempting to connect and bond and to help a child heal. 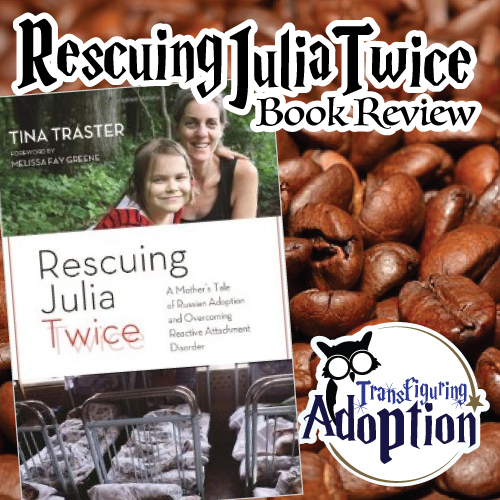 Rescuing Julia Twice was a refreshing break for me, providing another mother’s insights and feelings with the raw honesty that we all need to know we are not alone in feelings of guilt or inadequacy. 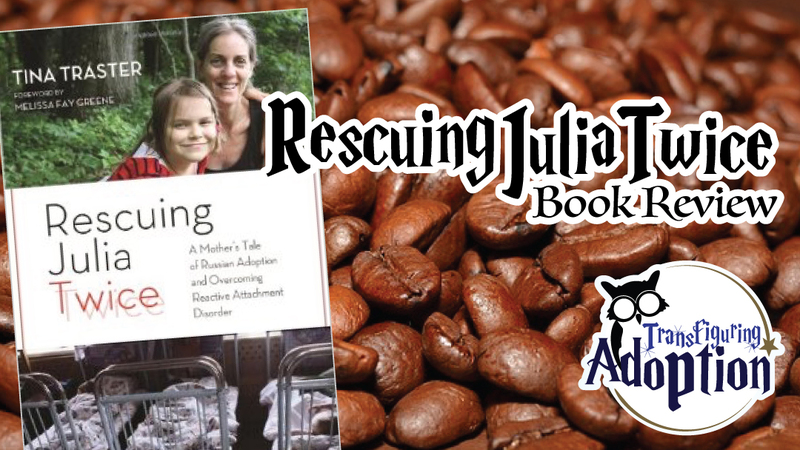 While some in the adoption community see the words “reactive attachment disorder” or “RAD” and rear back at what some have considered a death sentence of sorts in the area of relationship, Tina’s book shows that there is hope. A diagnosis of RAD does not make a chid unadoptable, unlovable, or unreachable. Her book ends with resources for families, so while it is not a how-to book, it does provide places for parents to go to seek help and healing for their child. As of tomorrow, June 6, 2015, all of our kids have been with us at least 6 years (6.5 for the younger two), and adoptions were finalized in 2011 and 2012. Most days can still be quite difficult as we seek to find diagnoses or treatments or the best educational routes, to connect with our kids while helping them become the best they can. But when I look back, I can see how far we’ve all come. 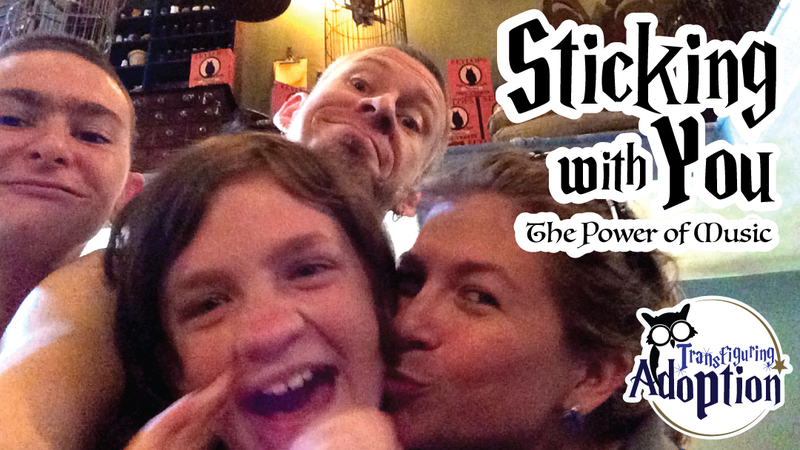 Yes, all six of us regress—the kids in their behaviors and us in effective parenting. However, I remember much more difficult days earlier on the journey, when the kids were newer to our home, when they were still in that impermanent physical and emotional place of being “foster” kids, when we were all adjusting to each other and learning to live as a family, when life was really hard for all of us. If you are or have been a foster or adoptive parent, you can relate. Trauma does crazy things to the developing brain, and as a result, to the behavior of a child. These beautiful children rage and meltdown. They destroy property and relationships. And it’s not their fault. We cannot fathom what they have been through. They have no reason to trust us. Sometimes we use every tool we know. All the professional help is not reaching them. What was I saying to her through these lyrics? I was singing of unconditional love, of doing what had to be done, of seeing past the fight she was putting up, and I reached her little heart. I was communicating in one of the most effective, understandable ways for her that I was on her team, and I was her ally. While at times she may have thought I was against her, it was really her and I against her past and her struggles. It was her and I on a quest to stop the maladaptive behaviors that didn’t truly get her what she wanted or needed. I wasn’t giving up. I was sticking by her, as were the lyrics of the song. We all know how easy it is to get songs stuck in our head, and they have great power over us. They have the power to change our mood, to give us energy or courage. There are times when our whole family is on the verge of major meltdowns when Darren turns on some music, and we all have an impromptu dance party. The tension lifts. Our spirits lift. We reconnect, and that is what all our families need for healing: connection. Music is powerful and can touch our hearts in ways nothing else can! 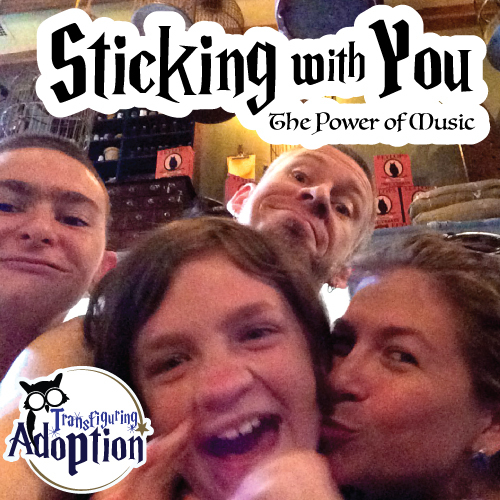 See our recently created song list [here] and make sure to comment with songs you have noticed stuck out to you or your children on the foster or adoptive journeys. Our list includes songs for many different types of situations…helping a child understand you love them unconditionally, helping self esteem, encouraging parents on the journey…and much more! Some songs we’ve seen recommended but have not yet listened to in a while or at all, so please have patience while we build out the topics more! Recently our family was on a trip to Orlando, FL, and Darren and I ran into the grocery store to grab some breakfast food for our room while my mom stayed in the car with the kids. After we checked in and moved our luggage in, my mom told me a story that greatly upset me. While we were in the store, the younger two kids were having a conversation in which Jasmine told Dalton that he was getting a lot of freckles, and it reminded her of [name]. Screams emanated from the back of the SUV. “No, [name] is MY brother!” yelled one of the older boys. My mom said, “And so is Dalton.” “No!” yelled the teen, “[Name] is my REAL brother.” My mom said a couple things to our son about what he had said and talked about how she addresses and loves her step-siblings as her own, and she didn’t even grow up with them. He didn’t really respond. Okay, so, hold up! The word “real” doesn’t fly around here. Our teen boys’ younger biological siblings, whom they were separated from when they went into care in 2004, are no more “real” than the two adoptive siblings they’ve been living with the last 6 years, the two who adore and worship them and want to be them, the two who love the teens’ biological siblings as their own and at times talk about missing them even more than the teens do. I was shaking in anger at the way this teen always treats the younger two, frustration at bonding and attachment issues in our home, and sadness with the way the foster care system separates siblings. I was a bundle of emotions and struggled with whether to broach the subject with our son. I don’t always say what I want or need to when I’m angry and emotional. I took a deep breath and went to the condo room where he was finishing unpacking his vacation clothes. What ensued was about 45 of one of the best and most real conversations my son and I have ever had, and I’d venture to say that it was a very healing conversation as well. I validated his feelings by telling him how much I thought it sucked that he was separated from his brother and sister. I reminded him that the younger two have a brother whom they’ve never met. I told him the feelings Darren and I experienced the first time we saw him and his brother reunite with their younger siblings and about how much grief we feel about everything they’ve been through. We talked about so many real-life issues and feelings. 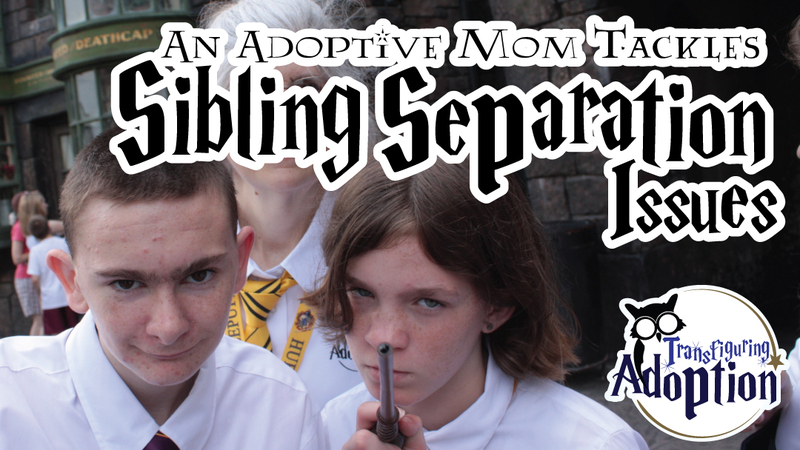 We sat in a tearful side-by-side embrace and discussed the dark not so miraculous aspects of adoption. In the end, I basically told him that his pain and grief are not an excuse to treat Jasmine and Dalton like lesser people, that that behavior had greatly disappointed and grieved me as I knew it did Jasmine and Dalton. I told him that I know his biological siblings love their adoptive siblings, parents, and other family members, and that’s okay. That doesn’t mean they don’t love or miss him. We talked about so many conflicting emotions, and I hope our conversation has a lasting impact. How have you dealt with these issues in your household? Leave your comments below! As our goal is always to help you spark healing conversations in your household, here are some questions you may want to talk about and some books that may help get the conversation started. What biological family members are you separated from? What types of feelings does not being with them give you? Do you feel cheated? Are you angry, sad, happy? It’s normal to feel a mix of all these and many more emotions. What can you do when you are feeling angry or sad or cheated? What makes someone a “real” brother or sister? A “real” parent? 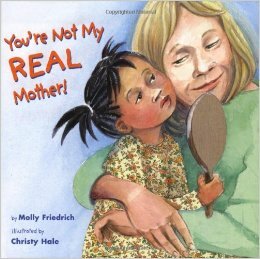 Saying someone is not your “real” family member can be very hurtful to them. 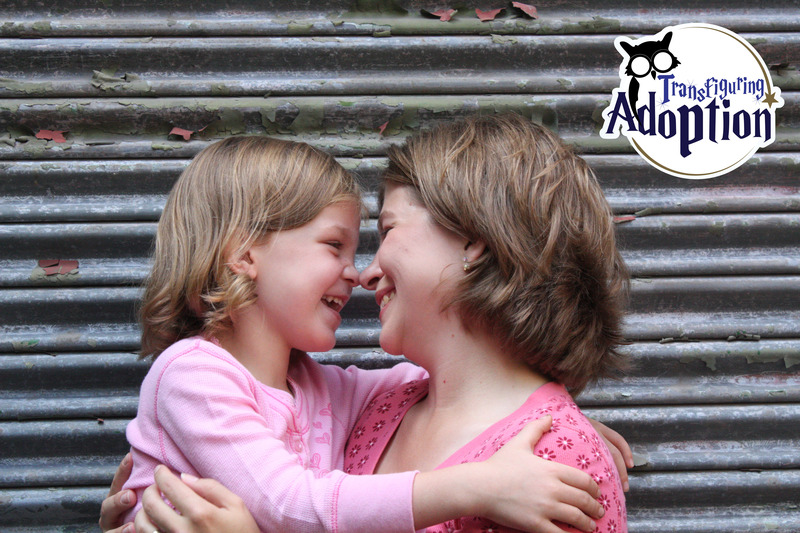 What are some better words to use to talk about adoptive and biological family relationships?